I love when writers/authors progress from their very first published work to a current state of confidence. I feel proud for them and of them. When I started reading Melinda Leigh with her first book “She Can Run”, as much as I was taken in by her writing, there was still an edge of rawness and the freshness of a novice. But now, as I read her new series Scarlet Falls, the progress is spectacular and her narration is seeped in conviction and self-confidence. “Hour Of Need” leads her new series Scarlet Falls and starts off the story with a devastating double murder of well-known couple Lee and Kate Barrett. A shocking event that shatters the peace of the tiny sleepy town of Scarlet Falls, and brings Major Grant Barrett from the front lines of Afghanistan to a family reeling under the loss of loved ones, and to an orphaned niece and nephew. As much as the murder is a mystery, the attempted kidnapping of the kids and her daughter puts Ellie Ross right in the middle of the Barrett family and their crusade in finding the truth. As the family rallies around the kids to protect them, a past murder rears its ugly head, bringing more danger and secrets from the grave. Even as Ellie and Grant find themselves falling for each other, the killer gets too close for comfort, putting Ellie’s family in danger as his demands spike. 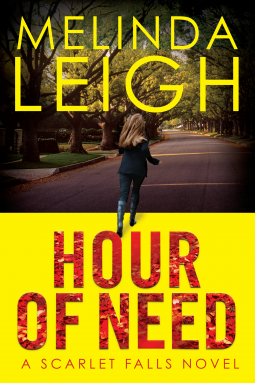 “Hour Of Need” is not a nail biting, falling of the edge, adrenaline filled thriller. It is the story of a normal family going through the turmoil of a life disrupted by unexplained murders. It is the story of a family with brains and courage wanting to put an end to the unexplained and it is the story of a family who would protect their own, yet doing the right things within their means. Equal measures of suspense, love and courage give this story a great start for becoming another fabulous series, just proving Melinda’s prowess as a romantic mystery writer.